Wind is a free, clean, renewable energy source. Wind turbines around the world are capturing the wind’s power and transforming it into electricity, with over 35,000 wind turbines operating around the globe. To harness the power of wind currents, a turbine’s blades spin clockwise, capturing energy. The main shaft is triggered to spin, which is connected to a gearbox within the nacelle. The gearbox directs the energy to a generator, converting it to electricity. The electricity then enters the power grid. Wind energy’s potential is huge. 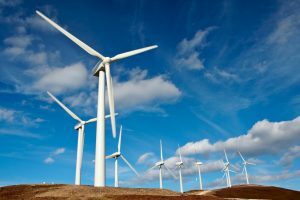 There is so much possibility for real growth in the future of this renewable power, and wind turbine manufacturers are racing to develop larger, more efficient wind turbines to serve the public need for electricity. Modern electric wind turbines vary in styles and sizes, depending on how they are used. The most common “horizontal axis design” is the most frequently seen and used, with two to three blades that spin upwind of the tower it is placed on. These horizontal axis wind turbines are made of three large parts: the blades, the tower, and a box behind the blades: the nacelle. The nacelle is where motion is turned into power. Large turbines have hydraulic controls that position the blades into the wind. The blades are attached to an axle that connects to a gearbox, and the gearbox controls the speed of the blades’ rotation, from 50 rpm to 1,800 rpm. The spinning shaft spins inside the generator, producing electricity. However, electricity without the right frequency and voltage will not be compatible with a utility grid. The speed of the generator will vary based on wind speed, which produces fluctuations in the power output.